First lesson learned: never leave for your proposed destination too late in the afternoon. We had been waiting for some drinking water to be delivered but by 4pm the water man still hadn’t appeared so, after sorting out a GPRS connection for the laptop (enabling us to get weather data on the hoof – supposedly), we left the marina and headed towards Kara Ada just a few miles away. The reason for doing this is because the marina charges by the night and having spent three nights in the most expensive marina this side of Italy we had to get out. Besides, the claustrophobia was doing my head in. Being in a marina is good for prepping the boat and going into town for a few beers but you can’t beat being at anchor. Or can you? A nice close-hauled sail turned into a broad reach as we reached the south of the island, despite a real beginner’s gybe (foresail flapping like crazy, backed over the forestay). That must have looked really cool. We trotted into the anchorage to find three German flagged boats occupying most of the available space. After circling the anchorage a few times and catching sight of a 150 kilo Kraut jump into the water, displacing fish and sea urchins aplenty, we decided to leave it and head to our contingency anchorage, Pabuç. Turned out quite nicely, thank you very much. 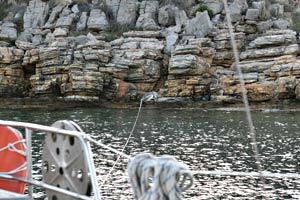 We anchored in the lee of the hill and tied to a rock, cracked open a beer and had a snack. All very innocent and quite pleasant. Notice how I make all that sound easy? This was Liz’s first line ashore and she executed this task perfectly. For those not aware, in Turkey it is quite common to take a line ashore and tie to a rock or tree to stop the boat swinging around on its anchor. When the wind is blowing this is a messy business as someone has to either swim or row to shore before the boat swings round and you run out of line, but Liz expertly took the line to the rock with ease. On top of all this we were able to get reception on the laptop to confirm the weather reports of a strong westerly for the next 24 hours or so. Whilst we were staying in the marina we met a very amusing live-aboard couple, Jan and Tony of ‘Red Marlin’, who were not only great company but very useful people to drill for tips and info. Tony admitted that they tended to live by the light, going to bed around 9pm and getting up early. The main reason for doing this was to conserve valuable battery power, so Liz and I took this on board and after a quick beer decided to go to bed early. Would have worked had Liz not spent the next two hours in bed making strange noises (without my input I hasten to add), but I’m prepared to try this theory again.